The hottest new hair care line in Japan! 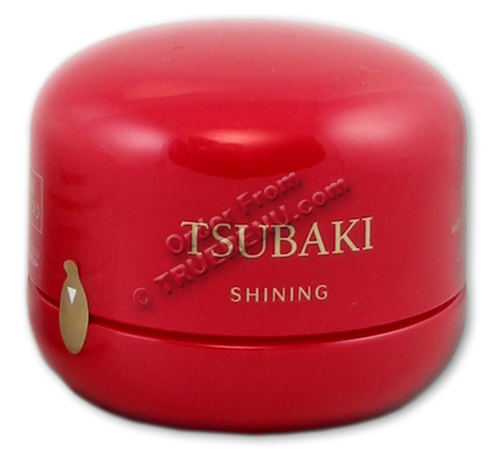 The Japanese camellia, or tsubaki, is delivered from Shiseido in packaging designed to resemble the Tsubaki flower. This is the Hair Mask, an intense cream pack for deep moisturizing and repair. Deep, intense conditioning for periodic use on all hair types. The Hair Mask is the 4th in the series: Shiseido Tsubaki Shampoo (4060 / 62), Conditioner (4061 / 63) and Treatment (4059) are also available. TrueRenu does the searching - and researching - for you. We look for hard to find, hard working products that do what they promise, and we bring them to you with detailed descriptions. For more fun, visit YouTube and search Shiseido Tsubaki to see the Japanese television commercials! After shampooing, massage the mask from scalp to hair ends. Wrap hair (optional) and wait at least 20 minutes before rinsing with warm water. Use once a week or as often as needed. Ingredients: (Incomplete): Camelia japonica seed oil, hydroxyethyl urea, PA/MA copolymer, fructose, hydroxypropyltrimonium starch chloride, pearl protein, lysine derivative. Product Size: Net Weight: 180g , or about 6.35 ounces.